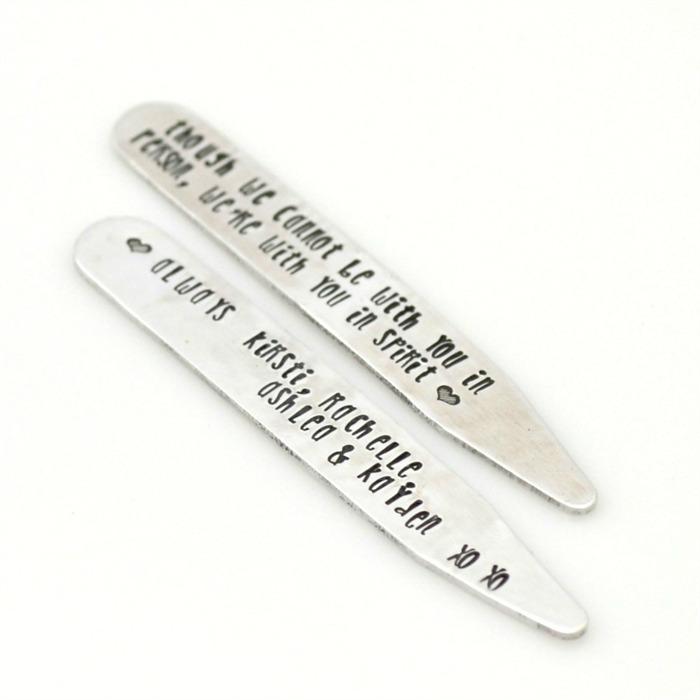 For the man with everything, this Personalised Collarstay Set is a wonderful gift. Perfect for Father's Day, a Wedding, Birthday or Anniversary. Stamped with your sentiment - names, dates or private message, he will wear it as a secret message tucked away into his collar. Please make a note to seller when purchasing with your font choice (Block uppercase, Playful unicase or script style) and details of message to be stamped. Collar Stays are sometimes known as collar sticks, tabs, collar stiffeners or just 'that bit in the collar'. Collar Stays are smooth, rigid strips of metal or plastic. Rounded at one end and pointed at the other, they are inserted into specially made pockets on the underside of a shirt collar to stabilise the collar's points. The stays ensure that the collar lies flat against the collarbone, looking crisp and staying in the correct place. 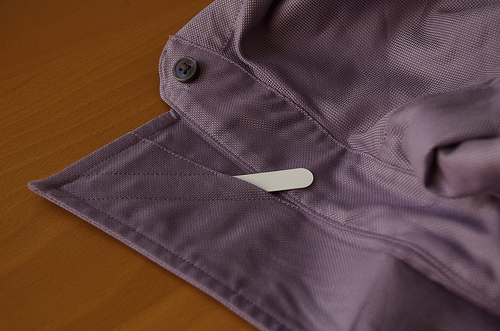 Often business shirts come with plastic stays which may eventually need to be replaced as the bend. Collar Stays are removed from shirts before dry cleaning or ironing as they could damage the shirt in the process, and then replaced prior to wearing. Personalised hand stamped jewellery orders will take on average from 1-3 weeks to complete. We always aim to have your orders completed quickly but there are times where due to high demand we are closer to the 3 week turnaround. Please allow adequate time for completion of your order when ordering for a special occasion. If you require your order by a specific date, feel free to contact us to see if we can meet your deadline requirements. ​Our coloured Aluminium gift range is remarkably easy to care for. We use this lightweight metal on keyrings, wallet cards and our Christmas tree ornaments. The anodised coating on the aluminium is what gives it the colour. This coating is very durable but can become scratched, especially when in contact with other metal (such as keys). It will not tarnish and there are no special care instructions for this metal... if it becomes dirty, just gently wash with soapy water and pat dry. Please pay promptly. Work will not begin on personalised orders until payment is received in full.